How to hold a successful garage sale! A step-by-step guide. Here's the tail end of our yard-sale, most of our stuff gone. As we all know, I LOVE yardsaling. 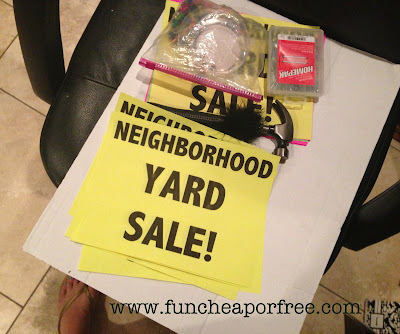 I am a Yard Sale Ninja, after all (See my best yard sale shopping tips, how I budget for yard sale shopping, and check out some recent yard sale finds here. ) 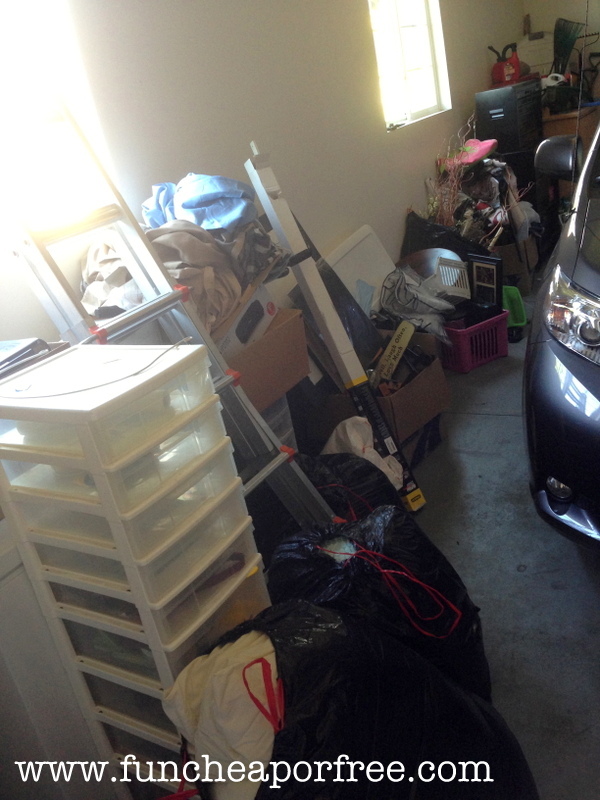 Well, this weekend I turned the tables a bit…and hosted our OWN garage/yard sale! Today I'll share with you my best tips for how to hold a successful garage sale, and hopefully take the headache out of the process for you (and make some dough while at it!). Enjoy! We recently started overhauling our house from the inside-out (mentioned here, and more on that soon!). One of the biggest projects? The dreaded GARAGE. Trust me guys, it was BAD. In deep-cleaning the garage we found a little bit of…no…little pile of…no, BIG-OL'- LOAD OF “JUNK” to get rid of. 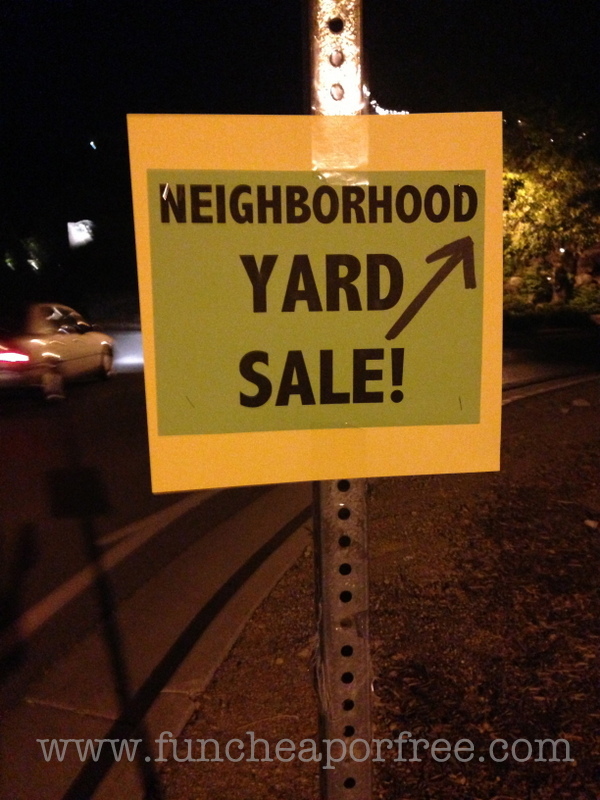 We wanted to get rid of it ASAP, so I decided to organize a yard sale! It ended up being a success. Rule #1 – yard sales are always, always, always more successful with more than one family involved. Small items sell well. As you can tell by the picture above, most of what we had was very small – small decor, toys, clothes. Small items sell well, but we didn't have nearly enough to hold our own successful sale. The good news? Lots of little things brought by multiple families = a large yard sale of sellable stuff! I asked a few of my close friends/neighbors if they would be interested in joining. As soon as I had interest from 2 people, I gave them the choice of two dates that worked for me and let them vote. You won't be able to please everyone so just pick a date and go with it. We decided on a place to hold the garage sale, the front yard of one of the two friends. Then, I sent out a reminder text/email a few days before, which people said was helpful. Start your YS early. Early birds are hard-core, and are ready to shop. Take advantage of them! I, myself, rarely shop past 9 or 930 because I figure all the good stuff is gone, so starting later (like 8:30) runs the risk of losing shoppers. Friday/Saturday sales are not necessary. Doing it Saturday-only is just fine. Most people work on Fridays, for one. Two, most of us yard-salers who see a “fri/sat” sale will avoid it because we figure all the good stuff is gone already. 2. Choose a good location. Cul-de-saks are fine. In fact, they make it easier to host a group sale because you could put everything out int he middle of the cul-de-sak, or put it all in your own yard and have people walk from house to house in the circle. Choose a location with lots of parking. If people have to park very far away, they might not want to check out your sale. Sorry to say, but people really do judge a book by it's cover. The nicer the house/neighborhood, the more interested people will be. If you don't live in a very nice neighborhood, maybe partner up with a friend/family member who has a nicer one. Ideal locations include: houses with large/flat driveways and large/flat front lawns that are close to the street. Parking lots are great. Indoor warehouse or gym (like a church or high school gym) for BIG sales. List it in your local newspaper. List it online: Craigslist.org is very important because that is what yard sale apps use to upload from.When listing your YS in the classifieds, list it the night before. In addition to Craigslist, list it in your local classifieds. In Utah, that's KSL.com. Give your sale a clever name. Don't just say “multi-family sale” or “moving sale”. Granted, those are better descriptions than plain old “garage sale”. But be creative! I posted it as “best neighborhood yard sale ever” then I listed the reasons why in the ad (all in one place, nice neighborhood, many families involved, listed types of items for sale). Describe what you are selling in the description of the ad. Kids clothes? Furniture? Crafting supplies? The more specific you can get the more it will help – especially if you are doing the YS on your own. Include pictures of awesome items. If you have a killer, modern, beautiful piece of furniture you're selling, post a picture of it! When it comes to signs, the bigger the better. Make them bright and easy to read. Less is more. Keep the wording simple and clear. For my signs, I simply wrote “Neighborhood Yard Sale!”. On a few of them I wrote the major cross-street and the date/time, see pics below. Lead the way. Draw big, bold arrows on the signs, pointing the way to the YS rather than printing on the address on every sign. If people are driving by they will rarely be able to read the address, but an arrow is visible helpful. As you can see, the sign on the right I wrote the major cross-street on the top as well as the date/time on the bottom. You can hardly read it! If I were to put the address/time on there, I would've printed the signs in MUCH bigger font and done it across 2 pieces of paper most likely. Printing signs on the computer is faster and easier than hand-writing them. I made some smaller, 8.5×11 signs and stapled them to 12×12 card stock scrapbook paper I had lying around. For large intersections where cars are forced to read the signs from farther away, I would recommend printing the signs over 2 pieces of paper and taping them one on top of the other. Use cardboard or poster board to support/back them. Be consistent. If your signs all look nearly identical, it will be easy for people to follow your signs. Pick a color scheme, for example, and have all your signs bright pink. Or use the same font or layout. If you buy signs, have them all the same. I recommend the Dollar Store for poster board and/or pre-made signs. Put your signs up the night before. If you can't do that, put them out REEEEEALLY early. I was out 'til midnight putting up signs, but it was one less thing to worry about the day-of. When putting your signs out, start at the farthest point AWAY from your yard sale, and end closest. That way you're closer to home when you're done, and if you run out of signs you can make more and it's not as far of a drive to go back and put more out. But most importantly, it's so you are forced to make the drive to your yard sale. Having the “driver's view” will help you see where the best places are to make signs. Make sure to have a big sign, with balloons even, at the street corner nearest your final destination. Once your signs are out, drive the “sign route” at least once to make sure they are all in the best spots. Yes, putting out signs takes forever! But it's worth it to do it right. 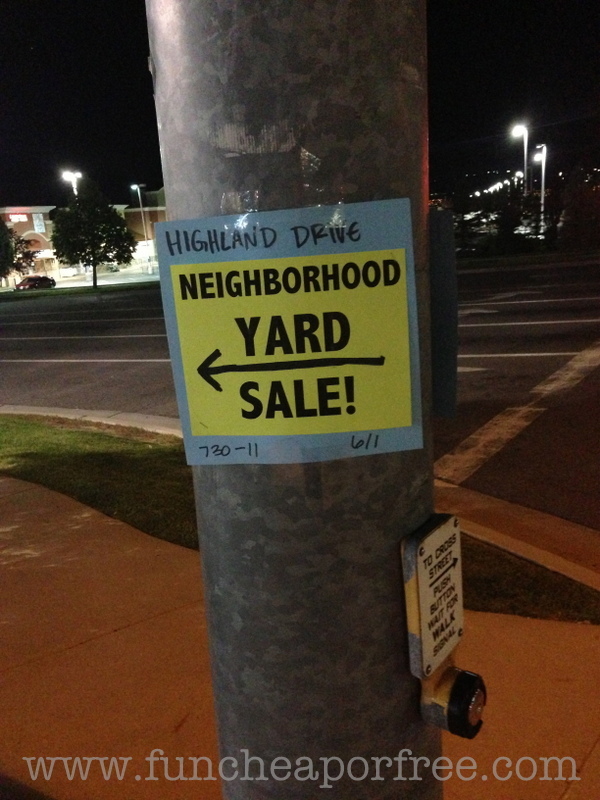 Many yard-salers just drive to busy intersections, look for signs, and that's how they choose where to go. For those who find you online, it still helps direct them to your house. Bring shopping bags. It will help people shop easier, and is simple common courtesy for helping people take their new treasures home. I hold onto my Walmart bags from grocery shopping and use those. I also had some big garbage bags. Bring a variety of change. I went to a gas station late the night before, bought me a donut and Gatorade (wow, twist my arm), and got $80 cash-back (because the banks were closed and ATM's usually only give you change in $20's). I got two $20's, two $10's, four $5's, and the rest in $1's. I had some quarters at home so I grabbed a handful of those. Mmmm…cash back for a donut? Don't mind if I do! Bring a chair to sit in. Trust me, it's going to be a long couple of hours. Bring a camping chair, even if you don't think you'll use it! Bring a fanny pack to carry your change. Yes, you heard me – fanny-pack. Keeping your cash in a cash box is dangerous, as is keeping it in your pocket. You want ALL your change on you at ALL times, and just know that you will NOT be able to sit (or stand) in one place the entire time. You WILL have to walk around, and though it doesn't look cool, fanny-packs are all-too practical here. Bring water and snacks. For obvious reasons…we are humans and need to eat 🙂 If your basic needs aren't met, you'll be tempted to pack up early so take care of yourself. Bring a marker, paper, and tape to mark large items as “SOLD”. Many times people will pay for an item and have to come back with a bigger car to get them, so you'll want to protect those items. Organize everything BEFORE the morning-of. See the next section for more on this. DON'T pre-price your items! Unnecessary and ineffective. However, it's ok to pre-think through prices, especially on your bigger items. More on this below in the “pricing/negotiate” section. 5. Display your items with intent. Create a display with your decor/furniture items. It looks impressive when people drive up, highlights the bigger items that you are bound to get more $$ for, and helps people “picture it” having a place in their home. Create a “display” with your items so people could picture them in your home. We were in the process of doing that in this picture. Use tables. I made this mistake, mostly out of pure laziness. I didn't haul tables with me and just set everything out on tarps instead…trust me, it's MUCH less desirable that way. Even if you only bring a few card tables or a long table or two, it will make all the difference in the world. I used a big tarp to display my items and it was harder for people to sort through my things. Tables are always better! If you are selling adult clothes, hang them up. Borrow a clothing rack, or string a rope from one side of your open garage door to another. If they are hung, you will sell more. People don't want to have to dig! Separate adult clothes by gender. Cardboard boxes are a great way to organize your items. Because you can write RIGHT on the box, and it's easy to donate un-sold items at the end of the day. Examples: Baby clothes? Toss them in cardbard boxes separated by size – “0 – 6 month girl”…”12 – 24month boy”. Toys? Toss them in boxes labeled by age “baby toys”…”boy toys”…”girl toys”…”stuffed animals”. Books, DVD's, Linens, all easier sorted by price, type, or size in boxes. Don't put price-stickers on your items (as mentioned above). When people are walking around looking at your items, they will only focus on the PRICE on the sticker. Even if it's only $1 more than they'd like to pay, often times they will walk right by. If you DON'T have stickers on, people are likely to pick up the item(s), bring them to you, and ask, “how much for this?” It gives you the opportunity to then negotiate on price if you name a price that doesn't interest them. See next tip. Don't price high! As mentioned before, people are LESS likely to negotiate than you'd think. If you price too high for whatever reason (it's a good brand! It's hardly used! These still sell for a lot in the store! I love this thing!...) then you'll have a HUGE pile of un-sold items that you have to pack up and take to Good Will at the end of the day. Trust me, I made this mistake with my first yard sale. Price it RIGHT THE FIRST TIME, sell it all fast, and get something rather than nothing for it. It's a yard sale for heaven's sake! People are there for the cheapest of cheap. If you want a decent price for something (especially large items), you're better off selling it individually in the classifieds. People will take anything if it's free. Our yard sale was scheduled to end at 11, and around that time traffic was slowing to a stop. We still had a bunch of stuff that we would have to pack up and haul to Good Will. Instead, we separated out anything that we still wanted to fight for a price for or stuff we wanted to keep, tossed everything else onto a big tarp and said, “anything on the tarp is free! Take it all!” Let me tell you…all the items that everyone had been passing by all day suddenly became the hottest items in town! People were grabbing things by the arm-loads! At the end of the day we all had one big cardboard box to donate…TOTAL! Between 5 families! It made clean-up much easier. Make sure to take down all your signs and delete your ad in the classifieds. You don't want people misreading the date and showing up at your house at 7am the next Saturday! So there you go! Again, see my best yard sale shopping tips, how I budget for yard sale shopping, and check out some recent yard sale finds here. The bulletin board of all bulletin boards…DIY for less than $13! What to do when you drop your phone or iPod in water…PLUS a custom iPhone case giveaway!! These are really great tips but honestly, I don't know very many people who like going to yard sales where they have to ask the price on everything! I can see how this may be a good idea on large, costly items but I usually walk away from a garage sale without things marked. I completely agree. I did a garage sale with a friend at her house. I showed up the night before with all my stuff marked, and none of her stuff was. The next day my stuff was flying! I made a whole heck of a lot more than she did. Maybe her stuff wasn’t as nice as mine… But I would watch people walk right past the stuff unmarked. I will leave a sale if things are not marked. I agree. Its awkward when people say “make an offer” because if you low ball it will make them defensive and if you atleast see a sticker with $2 but really only want to spend $1 you atleast know you are in the ballpark rather then expecting to pay a dollar and the person says “$6!! !” when you ask the price. All other tips are spot on though. This is a fantastic post! I also love to yard-sale, and I would love if everyone followed these tips, it would be so much easier! The worst is when people don't put enough clearly marked signs out, and you end up losing track of where you're supposed to be going. Is fall a bad time to have a yard sale? I am wondering if this is all seasonal (hosting and shopping at yard sales) or if it’s year round? Depends on where you live! In Arizona, for example, the Fall is the hot time for yard sales because it is too hot in the summer. Here in Utah the weather is unpredictable (and usually freezing) so yard sales are basically done by September. Where do you live? Some charities if you call ahead will come and pick up the “leftovers” from your yard sale and take it away. All you have to do is help put it in the truck and of course call ahead and schedule when they should come. No more taking several trips to the good will or thrift stores!